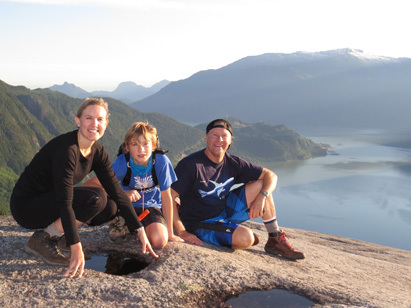 We recently returned from British Columbia, Canada, ministering for the first time there, where we spoke at a conference. 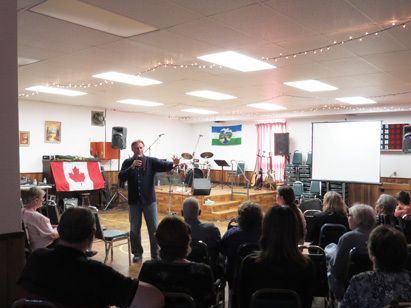 It was a blessing to be invited to be the speakers for the whole event and we were blown away how God poured out His power in Fort St. John, a city in the Northern region of British Columbia halfway up the Alaskan Highway. 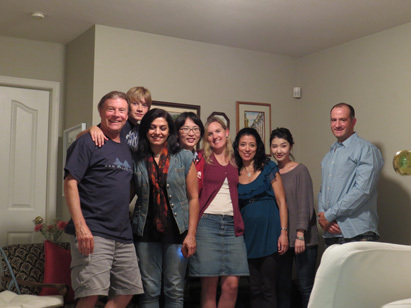 We were also blessed to visit and stay with our friend Aura in Vancouver and do some ministry with some people from her church as well. We had a very awesome time in both Vancouver and Fort St. John, and were also blessed to visit a few places there and on the way up as well. We had incredible meetings in Fort St. John, with an awesome outpouring of the Holy Spirit and a great visitation of God’s presence, as well as witnessing some powerful healings. We had testimonies of those healed of fallen arches, knee pain, back pain, shoulder injuries, as well as those who were set free from grief and depression. 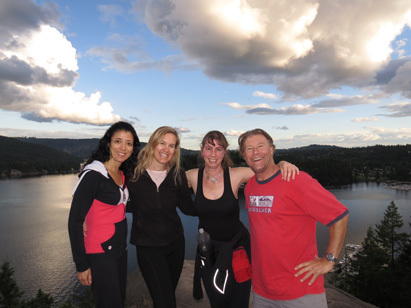 It all came about that we ministered in Canada in very supernatural ways: We had been running into a young lady by the beach named Desiree who invited us to a meeting in a church in Oceanside they were having late at night for a few people. We went and shared some mission stories with the group. When we were leaving we started talking in the hallway about the revival in Argentina with a young lady. The Holy Spirit started falling in power upon her as we were sharing and so we began praying for her. God started moving on other people and the next thing we knew there were a bunch of people on the ground in the hallway as the Spirit of God just started falling in power as we prayed for them. The Lord kept moving and the hallway was filled with people as we were praying for those coming by. One of the leaders of the group came up and began praying for us and had a word about Canada for us. He kept seeing Canada and felt the Lord would be taking us there in the future. Months later we were in Colorado where God opened doors to minister. Then we felt led to go up to Wyoming where we had a divine appointment with a young lady in a hotel that was coming out of a closed background to the gifts of the Spirit; she got filled with the Spirit when we prayed for her. While traveling around that area, I found a Canadian five-dollar bill on the ground and felt the Lord again stirring up Canada in our hearts. Then we received a letter at the beginning of the year from a friend and intercessor who gave us a word: she was feeling that we would be going and ministering in Canada soon too. Wow that was a lot of leading to get us ready! Shortly after this, we received a word and invitation out of the blue from Ken up in Fort St. John to come and do a three-day conference there; we both felt the leading of the Spirit for the date. The day we received the inviation, I opened my car door while getting gas in So. California, to find a bunch of Canadian coins right where I stepped out of the car--in the middle of the ground in a So Cal. gas station--wild!! The Spirit of God struck me with His confirming presence, and it seemed that not too long after all this leading and confirmation, we were getting ready to go and then were on our way! Wow! Hallelujah!!! After the Lord had been moving for over an hour already, a woman named Becky came forward while we were praying for some people and the Spirit of God was coming upon her as she was walking up. I felt led to give her a hug and the Spirit of God just fell in power bringing us both to the ground, and holy laughter just took over. I couldn’t get up from the ground as hard as I tried for about a half hour. The laughter then started spreading to other people throughout the room. We both gave a hug to Ken and others and the Spirit of God just kept spreading holy laughter, which brought such a wave of healing presence over the place; it was just amazing. A man named Dan shared how he had just read the scripture I shared while preaching that night and he realized he needed the filling of the Spirit. He said he was filled with the love and power of God in a remarkably new way, which brought a great and deep healing to him. It was just amazing, he said, for he felt the Lord transform his heart. I shared a word a few times over him about God answering his cry in the night, and he said that what was exactly what had been happening lately as he had been crying out to God in the night and was answered with His healing touch in these meetings. The next morning I (Bryan) woke up and was getting started with the day when I was struck to the ground by the power of God as I was just turning on the shower. I was overtaken by the joy of the Lord, and God’s power and presence just started flowing over me in great waves. I was getting touched so powerfully and laughing so hard under the presence of God I never made it into the shower!!! I just fell there under the presence of God and couldn’t even get in the shower! Somehow it was in God’s plan that I never ate nor showered that whole day and instead just spent the whole day getting hammered by God’s power!!! Shortly after this, Ken, his brother, and another friend Dave, showed up at the hotel they were providing us so generously with for the conference. We started talking and the presence of God just fell in power again and many of us were on the ground again under His glorious joyful presence!!! Waves of God’s love and power kept invading us all day long and we were just overtaken. The rest of the day, every time we tried to get going with something, God’s presence would overcome us and knock us back down. Neither Mercedes nor myself ever even made it to breakfast or lunch. We had some radical unplanned fasting, not eating a thing the whole day. (This type of fasting, initiated supernaturally by God’s Spirit is seen throughout the Bible, e.g. Paul (Acts 9:9) or Elijah (1Kings 19) vs. the ritual the Pharisees turned it into.) Dave, Ken’s brother, brought us a quick snack right before the meeting, to have some strength to preach. Everything that had been happening all that day was all preparation for that night. When the meeting started that night the presence of God was already thick because of what happened that day and the night before. I was sharing in the meeting about John Wesley’s conversion and how it was Martin Luther’s commentary that was being read in the church when Wesley was touched by the Spirit of God and converted at 33 years of age. Even though he had spent his whole life in a religious home, Wesley never knew Jesus and was not converted, though he went to church every Sunday. While telling this story and a few other things, the Spirit of God unexpectedly fell on me, even while I was still preaching. I was overcome by the presence of God and couldn’t even talk as I began to fall under the power of God and to laugh as the Spirit began to be poured out in the meeting. The presence of God just took over; all you can say is that the Lord decided it was His meeting and He was going to do what He wanted with it. It was amazing the outpouring that followed the rest of the night, as the Spirit of God just kept being poured out with amazing power for the next four or five hours. There were waves and waves of God’s presence washing over the meeting throughout the whole night. One after another, person after person was ministered to, and most spent some time on the floor overcome by His glorious presence, or in some way getting ministered to by the Lord’s power. Waves of God’s presence just kept rushing over the meeting the whole night, with great crescendos that burst out into loud, spontaneous, and raucous worship by everyone there, which would then be replaced by moments of quiet peace permeated by His love. It was clear that by the end of the meeting, sometime well past midnight, the Lord had birthed something, and something significant had happened. I think we finally got to bed around 4 am after all that kept happening. God continued the same way, even into the last night, with His power filling many, such as a young Japanese exchange student on her way back to Japan who got baptized in the Spirit and spoke in tongues for the first time. She is now going to reach out with the Gospel in Japan, some of the world’s toughest ground. Many testimonies also came forth of healings and miracles and the presence of God again overwhelmed us all as the Lord just visited us with such glory and grace again and again throughout the night. 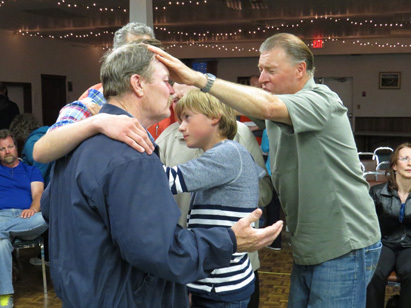 On Saturday night physical healings were evident as a strong canopy of God's peace came over the meeting. Fallen arches in one man with all the pain gone. Another man healed of shoulder injury. As well, an angelic looking 11 year old boy went down under the power where he remained for hours. This was all new to him and he commented the next day, "I love it there!" Sunday night a man received healing in his knees and a foreign student, a Japanese girl received the baptism in the Holy Spirit to take back to Japan with her. It was like a Revival Safari. God took us to so many different places and He did many different healings in people's hearts and bodies. Two different men were trapped in grief and hopelessness and set free and had joy return. Many weary and joyless people had their faith restored and their spirits revived. Tears flowed freely and laughter broke out. Friday night was mostly about healing of the hurting hearts with God's gentle love. What I am hearing from the people is the sincerity and love that comes through. The Marleaux's are so down to earth and yet touch heaven with their hearts cry bringing heaven to earth. As I watch the meeting videos I am astounded at all that God did. Every night was so different as God moved sovereignly. They have just poured themselves out for the people and especially for me. Every day I have grown stronger since the day they arrived here when I was still so frail from the PTSD [having survived being caught in a collapsing building] that I had to get my brother David and Dave Chan to host them for dinner as I was too weak and had to go back home to bed. I am so thankful for these two men who drove all the way from Victoria to support the Marleaux' ministry and help me host the meetings. David looked after renting a proper sound system and was invaluable with his skill set. 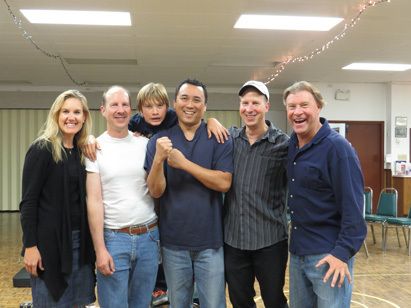 Dave Chan brought powerful prophetic words everyday and was an armor bearer." "... I want to read for just a second what I have written to my children "A couple… from CA & Argentina who live in southern California came up. Oh my, I am just streaming with tears thinking about how gentle they were with God's hurting and tired people. It just breaks my heart to be more gentle with Holy Spirit's amazing love. They were so sweet the way they portrayed and expressed the tender yet bold love and joy that Papa has for His sons and daughters as little children...Oh my God, I am just wrecked so much right now. Love you so much, Papa." We also had some powerful divine appointments around different parts of Canada where we prayed for a woman we met on a hike who was a fellow believer who also gave us some encouraging prophecies. We also prayed for a former pro athlete’s hurting knees that we met while on a little walk near the coast, who was very encouraged by our prayers. Other divine appointments continued as well while there. Some incidents on the way home speak to what God’s doing and what we experienced as we followed His wind along the coast. We made a stop in Northern Oregon on the way down to find an 8-to-12-foot, out-of-season swell hitting an awesome left point. Though a bit heavy, I was able to get some great waves and was blown away to experience a place like this breaking at this size so unusually in the middle of summer. Shortly afterwards I opened the Bible to find a word confirming God’s desire to revive the Northern areas. Our old friend and mentor Harald Bredesen had ministered up in these areas of Canada before and we have sensed the Lord is going to move again there in a significant way. We feel we avoided an attack of Satan on the way home too with the help of a story from “Christian Surfers USA”. We pulled into a gas station and I noticed gang-looking dudes slowly coming up from different directions towards us. I remembered that the leader of Christian Surfers USA had just shared how he was just robbed this exact way recently. So I ignored my empty gas tank and bursting bladder and got back in the car and split. Praise God! We knew we had done the right thing. The devil, however, does wait until your guard is down, and I had my phone stolen a little later when not paying attention. We appreciate your help and prayers in helping us out in the battles faced in ministry. 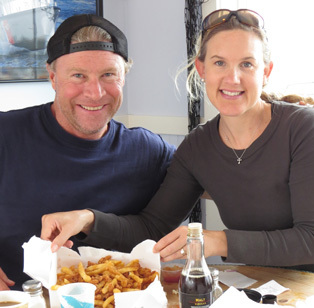 These days, one of the biggest expenses is gas, combine that with food and lodging along the drive up, and you get yourself a bit of a bill to deal with. We appreciate your prayers and support as we have been blessed to see fire come to these Northern regions, so your help in supporting the effort to get there and back would be greatly appreciated and blessed in good measure, pressed down, and overflowing, as you step out in faith to aid us in our effort.